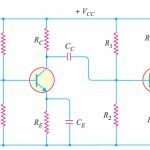 are known as impedance coupled amplifier, the impedance of the coupling coil depends on, Its inductance and Signal frequency. Moreover, the secondary winding also provides a base return path; hence there is no need for a base resistance. Amplifiers using this coupling are called transformer-coupled amplifier. Direct coupling: this coupling is used where it is desirable to connect the load directly in series with the output terminal of the active circuit element. Dc component of the output does not disturb the normal operation of the load device. Device resistance is very low.